Last year, during the first week of December, I had a dessert party. It was during the whole South Beach Diet craze, so I named it the North Beach Diet Party. I made seven different desserts. From scratch. By myself. In two days. It was awesome. Then I invited about 40 of my closest friends, and friends of friends over to eat everything. And they did. The reason I’m even mentioning this, is because my friend Sarah, her fiancé John, and Sarah’s mom Sally came over that night. By the time they left, Sally was stuffing cookies in her pockets to take home, despite my offer to give her a doggie bag. 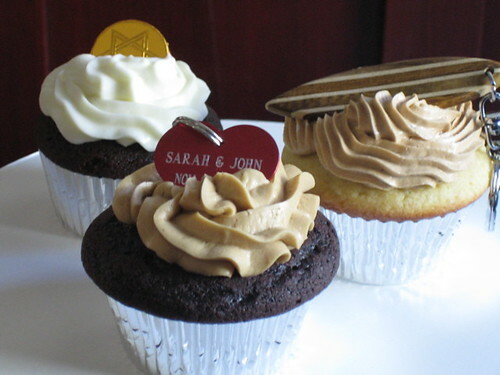 Then one thing led to another, and pretty soon I offered to bake Sarah and John’s wedding cake. It’s not as crazy as it sounds. They’re a super mellow couple, and the reception was small, so it was really fun to prepare for. 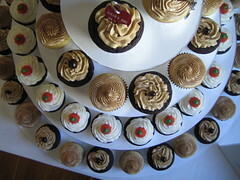 In the course of our discussions about what to make, I suggested different types of whole cakes, a croque en bouche, or a trio of cupcakes, two dozen of each flavor. In the end, the cupcakes won for two reasons. First, they’re cute. And second, three flavors are better than one. We tossed a whole bunch of flavor ideas around, until we settled on three good options: chocolate with coffee buttercream, vanilla with hazelnut buttercream, and ginger with lemon cream cheese frosting. Like most women would, I started with chocolate. I researched on the web and consulted all my favorite cookbooks until I found a few recipes that sounded promising. I began with a Martha Stewart recipe after I found a blog post that said this particular recipe was the best she’d ever tasted. I figured that was high enough praise to make it worth trying. The recipe called for 3/4 cup of cocoa powder. That scored many points. It was easy too, earning it more points. The batter was thick and heavy with chocolate. I figured this would be the one and I would only make one test batch. The result was delicious, but they were too dense and dry. Almost the density of pound cake. 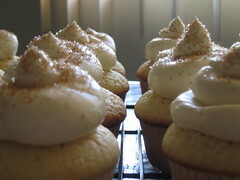 Had they been pound cake, I think I would have liked them better, but as cupcakes, they weren’t right. I took them to work to make sure that my assessment was correct. Despite the fact that the cupcakes didn’t survive until lunch, my boss, who also likes to cook, confirmed my “too dry” verdict. I was validated, and went back to the drawing board. I was really hoping that The Book of Great Desserts by Maida Heatter would have an amazing recipe, but sadly, she didn’t do much cupcake baking. Then I remembered a Cooks Illustrated issue I’d gotten a few months back that talked about the perfect dark chocolate cupcake. Could it be? A perfect chocolate cupcake? Realizing that the only downside to trying the “perfect” recipe would be a very delicious mistake, I went for it. And sure enough, they were exactly what I was looking for—light, moist, and oh so chocolately. 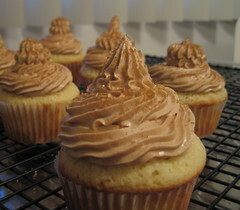 Once the cupcake recipe was decided upon, I needed a frosting recipe. I’d already tried a coffee buttercream recipe that took a long time and required so much butter I was afraid I’d have to buy my own cow, so I looked for a viable alternative. 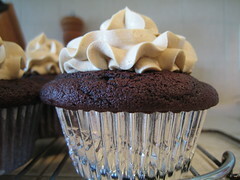 I remembered the sidebar on the Cooks Illustrated site had lots of frosting options for the chocolate cupcakes, so I took a peek and found an easy coffee buttercream option. It only called for half the butter of the other recipe, so I gave it a whirl. Not only was it super easy with half the butter, it was also twice as good. And so quick! One recipe, done. On to trial two. The next two cupcake recipes were simple. 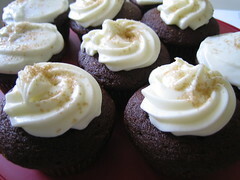 A Google search for gingerbread cupcakes yielded a delicious and easy recipe from Martha, and I returned to Cooks Illustrated for the vanilla cupcake recipe after the success of the chocolate one. Both were excellent. Nigella Lawson had a fabulous recipe for cream cheese frosting that I paired with the gingerbread, and a dash of lemon oil added the yummy zing I was looking for. The only remaining frosting was the hazelnut flavor. Since it had been a special request of the groom, I took my frosting task seriously. I went to supermarkets and specialty food stores in search of hazelnut flavoring. After some searching, my only option was at Surfas. They had the Lorann Gourmet brand of fake hazelnut flavoring. I don’t like anything that’s fake, and I’d read a bad review of the Lorann flavorings, but seeing as it was my only option at that point, I bought it anyway. The frosting I made with the scary concoction that came out of that bottle was so gross I’m amazed my friends ate it. I was heartbroken. Not wanting to give up on the hazelnut idea, I brainstormed. Nutella? Hazelnut syrup like the stuff they put in coffee? What could I use? Then I remembered the hazelnut spread my aunt had raved about at Le Pain Quotidien. On my way home from work one day I slipped in just before closing and bought myself a jar of their hazelnut praline. In a moment of inspiration, it occurred to me to use it instead of peanut butter in a peanut butter frosting recipe. It was so decadent and rich, it tasted like truffle filling. It was perfect. Over the course of a few weeks I baked so many cupcakes people started expecting them at work and were disappointed when there wasn’t a new batch to test. Thanks to all my practicing, by the time the wedding rolled around I was super efficient in the kitchen. Everything was perfect. 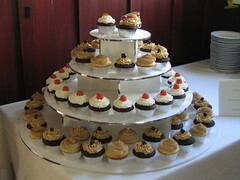 I even built a cupcake tier to hold all the cakes. As cake toppers, I bought little mementos that each symbolized the bride and groom. John requested surfing as his theme, so he got a little wooden surfboard keychain. Sarah loves dogs, so I got a big red heart-shaped dog tag engraved with their names and the date of their wedding. 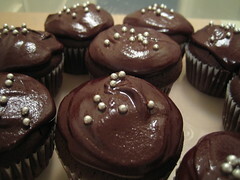 On the third cupcake, their “one to grow on,” I put a chocolate coin to symbolize good fortune for their life together. My favorite moment from the wedding was watching Sarah’s dad and her two sisters stand in a circle passing the three different cupcake flavors around so they could taste them all. And so as my first post in a very, very long time, I’d like to congratulate Sarah and John and wish them a very sweet life together. Thanks for the encouragement regarding my baking abilities, and the inspiration to try new things. Since there are so many recipes, please email me if you'd like one.